Just over a month away from critical elections across the country, the wide Democratic enthusiasm advantage that has defined the 2018 campaign up to this point has disappeared, according to a new NPR/PBS NewsHour/Marist poll. In July, there was a 10-point gap between the number of Democrats and Republicans saying the November elections were "very important." Now, that is down to 2 points, a statistical tie. Democrats' advantage on which party's candidate they are more likely to support has also been cut in half since last month. Democrats still retain a 6-point edge on that question, but it was 12 points after a Marist poll conducted in mid-September...With Democrats already fired up for this election, the Kavanaugh confirmation fight has apparently had the effect of rousing a dormant GOP base. 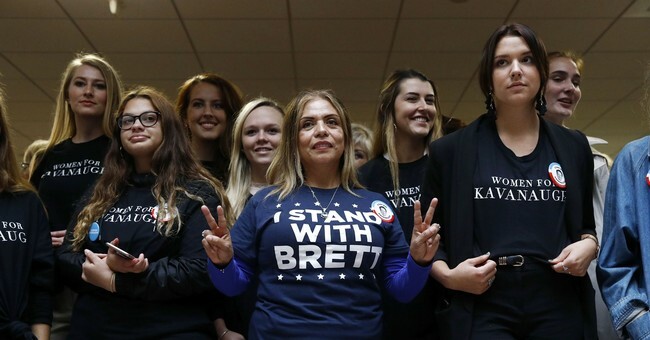 "The result of hearings, at least in the short run, is the Republican base was awakened," noted Lee Miringoff, director of the Marist Institute for Public Opinion, which conducted the poll. A good PA source saw a similar trend in internal polling there. Republicans are virtually tied in Arizona, Indiana (this poll was in the field prior to Sen. Donnelly finalizing his 'no' vote on Kavanaugh), and Missouri. They've pulled ahead in Tennessee. And hoo boy, Heidi looks like she's in trouble. That's two surveys in a handful of days showing her down double digits. With the Kavanaugh vote looming, and her state overwhelmingly in favor of his confirmation, I wonder what this friendly little chat was about? This dude wanted to remain unnamed because he wanted to check with the guy he thinks he remembers hearing it from before having his identity attached to to this controversy, but he couldn't reach him. The New Yorker could, however, and did. It turns out that the source of the originally-reported secondhand hearsay...doesn't remember it happening. The bottom has fallen out from an already non-credible story.